What comes to mind when you think about catching California’s winter wave? Do your thoughts head for the sea? Surfing the winter swells that break along California's shore? Or maybe it's sinking your toes into the sand on a beach warmed by the midday sun? Perhaps your thoughts head for higher elevations and snow-covered mountains? Snowboarding or skiing through fresh Sierra powder? Maybe a combination of all the above? When it comes to catching both literal and figurative winter waves, the California experience is unique. Blessed with a geography that connects some of the country’s most inspiring and iconic mountains - the Sierra Nevada - to the waves, salt and sand of the Pacific Ocean within a four-hour drive, California should be on the short-list for any adventurer lusting for a unique active winter trip. The hook: The Golden State is one of the rare special places where you can ski/snowboard AND surf/dig your toes into the sand on the same trip. Imagine that for a moment: waking up to powder turns above Lake Tahoe one day, and then surfing the golden sunset glass-off session the next day. Finding a winter wave to ride above the waters of Lake Tahoe . Photo by Aron Bosworth. As gravity dictates, it is easier to travel downhill than the other way around. Likewise, we recommend beginning this multi-sport winter adventure in the mountains (of course the arrival of a new swell or a foot of fresh snow may influence where you choose to start – one must be flexible). While there are many well-suited mountain locales to begin a trip like this, in terms of scenic beauty, ease of access, and the variety of world-class ski terrain both inside and outside the ski resorts, the mountains surrounding the waters of Lake Tahoe are second to none. Lake Tahoe's cobalt blue waters are surrounded by snow-covered peaks in winter - a spectacular sight by any measure. As far as ski options, this is California ski country, with at least 10 ski resorts and a variety of terrain for all abilities to choose from. And for those with backcounty ski and avalanche training, knowledge and know-how, there may be no better place in the Lower 48 than Lake Tahoe for backcountry turns during a stable snow-cycle. With that in mind, consider starting your adventure in the Donner Pass area north of Lake Tahoe where higher elevation and north-facing resorts like Sugar Bowl Resort often hold the best snow. Sugar Bowl Resort itself is home to accessible side country, and nearby areas like Castle Peak and Donner Ridge offer additional backcountry options. If your idea of catching the winter wave consists more of a cross-country skate or trek through the snow, the Donner Pass area has both covered, with cross-country skiing and snowshoeing trails at Sugar Bowl Resort and nearby Royal Gorge Cross Country Ski Resort. Heading south to Lake Tahoe’s cozier west shore, a lineup of eye-catching peaks rise directly above the waters of the lake. The northernmost of these, Homewood Mountain Resort, is a welcoming ski resort offering some of the best lake views one can find skiing in the Lake Tahoe Basin. 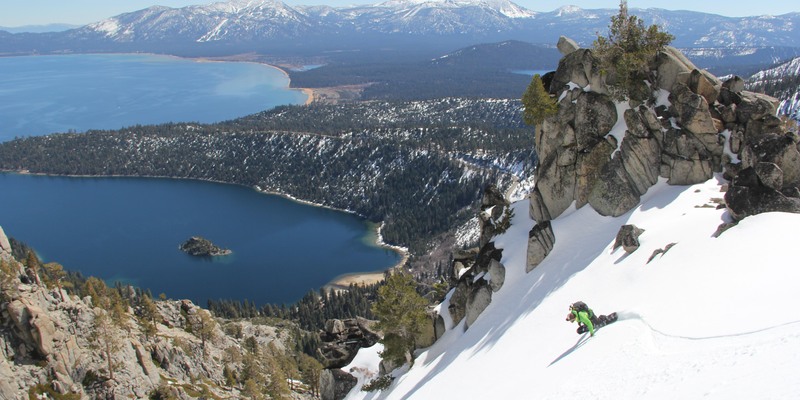 Experienced backcountry ski and splitboard enthusiasts may feel the pull further south, where folks start the day climbing a steep skin track up one of Lake Tahoe’s backcountry classics like Jake’s Peak. It should be noted that Lake Tahoe’s west shore is not beginner-friendly backcountry terrain. As is relevant to any backcountry winter travel, ensure that you and your group have the proper avalanche education, training, and know-how to employ safe decision making, including knowing when not to go if stability is in question. For Lake Tahoe area snowpack and stability information posted daily during winter and early spring, make sure to consult the Sierra Avalanche Center bulletin before heading out in the backcountry. 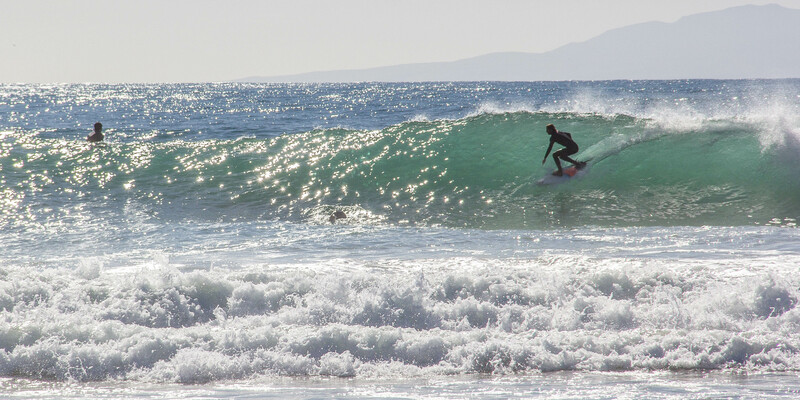 Conditions align for fun winter waves along the Santa Barbara coastline. Photo by Aron Bosworth. After a few days in the mountains you may feel your internal compass shifting toward a down day and some recovery time. Take this signal as a cue to start heading west for the second leg of your summit to sea adventure; you are now coast-bound! There are multiple driving routes to choose from in leaving the Lake Tahoe area mountains behind and heading west toward the coast. Highways 50 or 88 are recommended; however, regardless of your chosen route, make sure to set your GPS destination to Surf City, otherwise known as Santa Cruz, California. The town of Santa Cruz lies on the northern shore of Monterey Bay about 2 hours south of San Francisco on California’s Central Coast. It also happens to be one of the best locations for surf in the state due to its exposure to swell from all directions, making it just about as consistent as anywhere for catching waves in the winter. Add to that the protection from prevailing winds afforded by a south-facing coastline, and you have an ideal location to kick off your coastal leg. Once in Santa Cruz, world-class breaks at Steamer Lane and Pleasure Point offer multiple surf spots ranging from intermediate to advanced. Depending on the size of swell, waves can range from waist-high to double overhead and larger on the biggest winter swells. If you are new or newer to surfing and would like to keep things relatively mellow and avoid the potential of being a hazard in the line up, your best bet is to head to a spot inside of Steamer Lane known as Cowells. Note that water temperature in Santa Criuz can range from the low to high 50s in the winter, so plan your wetsuit choice accordingly. Beyond surfing, Santa Cruz offers plenty of other outdoor activities throughout the winter months such as whale watching and stand-up paddling based out of the Santa Cruz Harbor. Mountain bikers and hikers will love traversing the trails above town in the redwood-covered Santa Cruz Mountains. Continuing south from Santa Cruz along Highway 1, you’ll soon enter Big Sur, a wild and dramatic stretch where coastal mountains drop steeply into the sea. Driving through and exploring Big Sur’s sweeping vistas and postcard-worthy state parks is an adventure unto itself, and you’ll get plenty of jaw-dropping coastal scenery from driving the highway alone. Big Sur beach access and surf options are much more fickle, spread out, and wild. However, if weather, wind, and swell align, there are a two beaches worth checking for some scenic beach time and possibly a surf. In northern Big Sur, Andrew Molera State Park is home to a beautiful beach well worth the mile hike in. In southern Big Sur, Sand Dollar Beach affords easier beach access in a beautiful crescent-shaped cove that can offer fun waves when the swell isn't too big. Beyond its wild nature, Big Sur sits on the cusp between the slightly chillier coastal climate of Northern California and the warmer, often balmy Mediterranean climate of Southern California. One of the many wonderful draws about this stretch is that it’s not uncommon to encounter 75 degrees and sunny days when a winter high pressure ridge settles over California. Once you’ve had your fill of Big Sur, shift into gear once again and continue on down the road toward the warmer climate and warmer waters of the American Riviera, the Santa Barbara coastline. You could do this in one day in So. Cal. Board or ski at Big Bear, surf at Manhattan or Newport Beach. While you aren't likely to get in backcountry skiing (unless it is a great year - you could do Baldy), you can actually enjoy the warm sun and water of the real south coast. As for Tahoe, Kirkwood has some of the best snowpack in the area. Plus, a cross country ski area and lots of steep downhill terrain. Plus, lots of backcountry opportunities in the surrounding area.